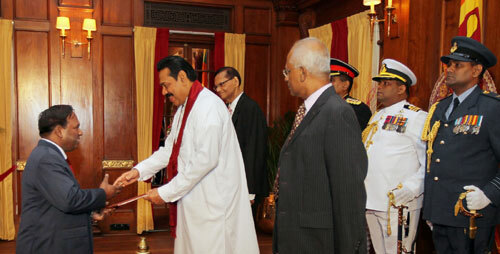 Six new foreign envoys including five High Commissioners and an Ambassador taking assignments in Sri Lanka presented their credentials to President Mahinda Rajapaksa on 12 August (Monday). 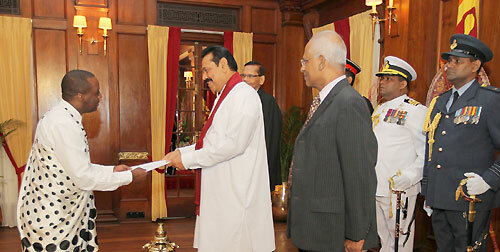 The ceremony for the handing over of credentials by the new diplomats was held at Presidential Secretariat in Colombo under the patronage of President Rajapaksa. Thereafter the new diplomats joined in a discussion with the President. Welcoming new envoys to the credential ceremony the President said that they are all joining their assignments at a crucial time when the country is getting ready for the Commonwealth Heads of Government Meeting (CHOGM) - 2013 in Colombo. The Commonwealth Summit which is scheduled to be held in November will undoubtedly be the largest conference ever organised by the Sri Lankan Government. The President further noted that Sri Lanka’s economy is at a rapid growth after eliminating thirty years of terrorism and the Government’s rehabilitation, reconciliation, resettlement, reconstruction and development process have achieved a huge amount of progress within a short period of time. The President also said Sri Lanka seeks to work with the international community and requested their support to rebuild post war Sri Lanka, which would create an environment for the progress and prosperity of people. The new envoys representing African nations pledged their country’s support for the CHOGM and to work diligently to strengthen bi-lateral relations as well as their goodwill and assistance for CHOGM and government’s development projects. The new envoys assured their participation actively at the highest level in the forthcoming CHOGM in Sri Lanka and expect to have a good outcome at the summit. They further said that it would be the ideal forum to promote the country’s image globally and dispel misconceptions on Sri Lanka internationally. After the presentation of credentials, the new diplomats signed the VIP visitors’ book. The credential presentation ceremony was attended by the Minister of External Affairs, Prof G.L.Peiris, Secretary to the President Lalith Weeratunga, Secretary of the Ministry of External Affairs Karunaratne Amunugama and senior officers representing Sri Lanka Security Forces. Chief of Protocol of the Ministry, senior officials of the Ministry of External Affairs and officials of the respective missions were also present at the occasion.